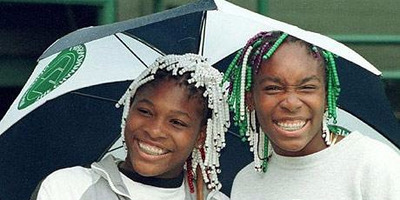 Venus Williams started playing tennis with her sister Serena when she was 4 1/2 years old. Their father coached them and had great aspirations. He had a 78-page plan to turn them into tennis champions – which he wrote before they were born. The plan, paired with Williams’ extreme natural talent and drive, worked. 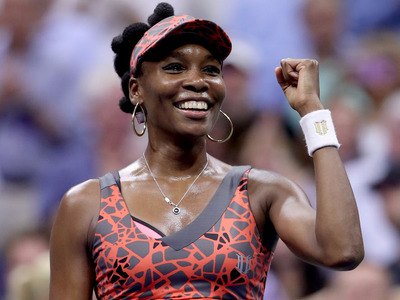 Venus Williams is one of the most dominant tennis players in history, with seven Grand Slam singles titles and four Olympic gold medals. On top of defending her No. 5 world ranking, she runs two businesses, EleVen, an athletic-clothing line, and V*Starr, and interior-design company. 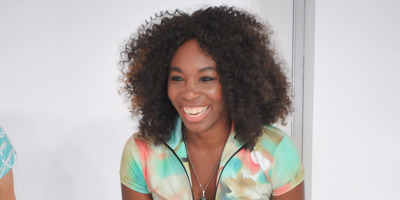 Venus Williams is one of the most dominant players in women’s tennis, and has been for over two decades. A tennis prodigy who turned pro at age 14, she’s won four Olympic gold medals and seven Grand Slam singles titles. In the process she’s broken through all sorts of barriers in the sport. On this episode of “Success! How I Did It,” Business Insider Editor-in-Chief Alyson Shontell spoke with Williams about her rise to superstardom and the hardships and successes she’s faced along the way. The interview took place in Manhattan at The Wing, a coworking space for women, where Venus was giving a talk about entrepreneurship. The following is a transcript, which has been edited for clarity. Venus started training with her sister Serena under their father when she was 4 1/2 years old. Shontell: So, Venus, you started playing tennis really young, I think your dad had you on the court when you were 4 1/2 years old. Williams: Pretty early on. It’s got to be definitely a part of your dream, because it’s a ton of work, a ton of dedication, a ton of focus. It’s intense – learning a sport, especially a sport like tennis, where it’s so technical and it’s so, like, minute details. So I think the dream definitely became mine early on. Shontell: Your dad didn’t play tennis, right? So neither of your parents did. How did he know how to train you both into superstars? Williams: Well, they didn’t play professionally, but they actually did play the sport, and I think that they were both athletes at heart. I most certainly believe that when you’re an athlete, that really translates to all sports. You just understand it, your body understands it, and your mind understands it. And you just – it just clicks. I’ve found that happening when I play other sports. I’ve seen it, like when I’ve hit the ball with other professional athletes, and you can see they’re just learning so quickly. It’s just something that’s in their blood. So I think it was in my parents’ blood and they understood. Shontell: How did you train when you were first getting going? How many hours would you put in on the court, like in grade school? Williams: Definitely a lot. Three or four hours a day, sometimes more. I can’t remember exactly. I do remember the lights would go out and we’d be kind of happy – it’d be dark. Shontell: Fom an early age, too, it seems like you were always in the media. Your dad got the local press involved, and I know Serena has said, like, she doesn’t remember a moment when there weren’t interviews going on. How did being in the spotlight at such a young age shape your career and your passion for it? Williams: In a lot of ways, it’s super helpful because you’re on the radar, it helps you to find sponsors, find support, and a lot of people want to help you. But at the same time it creates a lot of pressure, so you have to know how to deal with that. It’s either you make it or your don’t. Sometimes it might be a little easier to be under the radar because there’s no pressure. But thankfully, you know, we were able to handle it. It’s like maybe one of a hundred who could. I don’t know the formula being able to handle that pressure. Shontell: Yeah, I mean, we’re sitting here at The Wing and you just gave a great interview, and someone asked you, “Did your parents have the winning formula for helping you and you sister become stars, and isn’t that like a little bit risky?” and you said, “Yeah, I guess it could have been risky.” Do you think it was? Williams: It was definitely risky, to put your time and your heart into, but sport teaches you so much, and you can translate that to other parts of life. But it’s definitely a lot of dedication, not just for, you know, myself or the children, but the parents, the family finances, the money that you could be putting toward retirement you’re using to buy tennis shoes and restring rackets and tennis lessons. So if you don’t make it, then you may never retire. It’s definitely a lot of risk. Shontell: Yeah, definitely. So you always wanted to be pro. I’ve seen interviews where you were really young, saying like, “I’m dreaming of this.” When did you realise that you were actually good enough to do it? Williams: Definitely really early on because I was beating adults handily, mercilessly. And that was a great feeling, but I think pretty early on. You can’t really hide whether you’re good or not, so that was just, I guess, apparent. Shontell: When you were 10 your family moved from Compton to Florida so that you could be in the tennis academy. Do you think that was a life-changing move? Williams: What would have happened if we had if we had stayed in California, I don’t know. We’ll never know. So I guess it was life-changing. Getty ImagesVenus went pro at 14. She’s gone on to win seven Grand Slam titles and four Olympic gold medals. Shontell: I guess it worked because at 14 you went pro. Do you remember your first pro game, what it felt like? Williams: Yeah, how could I forget? I was definitely nervous. No one wants to lose their first match. I remember all my nerves dissipating after the five-minute warmup, which is a miracle! And I have no idea how I won that match. I had no game plan, no strategy, nothing, but maybe the woman I played against was more nervous, who knows. It’s hard to go up against a 14-year-old wildcard with a lot of hype. That couldn’t have been fun. She probably was just dreading it when she saw the draw. But thankfully I was able to win that first match – not the second – but the first one’s always nice. Shontell: First one counts – counts a lots. Williams: Yeah, first one counts. Shontell: At 15 you scored a huge endorsement with Reebok, worth about $US12 million. How did you figure out, “Oh, my God, this is a lot of money”? How’d you figure out what to do with your new fortune? And stay focused? Williams: I recall shopping at Wet Seal. I was a regular kid, to be honest. I think at the time Clueless was out, so kind of wearing those dresses, and just kind of being a kid. I didn’t spend any money at all. And my biggest purchase was an SUV and that was it. Shontell: An SUV is pretty good. But you had to be very mature from a very young age. Did that come easy to you? Williams: Definitely sport matures you, if you let it. It definitely makes you grow up because you have to work so hard that if you can’t, then you probably aren’t going to have the mental capacity to handle it all. That probably played a role in growing up a little faster than maybe other people. Shontell: You came into a sport that was traditionally very white, affluent, not easy to break into, not always the most accepting. You came in with a lot of style. You had beads in your hair. I remember there was one game where you were actually robbed of a point because one of the beads fell out while you were playing, which is crazy. So from a young age you had to deal with things that you really shouldn’t have, and nobody should, from a racism standpoint in this sport. How has this shaped you as a player? And how did you learn that this wasn’t going to be fair? Williams: At the end of the day, you just have to focus on winning. No one can take a win away from you. That’s what I focused on. Life is not fair, so I don’t go out there expecting it to be. I don’t think any of us should go out expecting life to be fair. I think that’s expecting too much, and I remind myself of that sometimes. You can get on with your life after that. Shontell: That one game must have been so frustrating. Williams: There have been many frustrating games. I don’t there’s going to be another one that isn’t frustrating. That happens, but that’s sport. Otherwise why would there be so much glory in victory. Matthew Stockman/GettyWilliams has kept returning to the top despite multiple injures, being diagnosed with Sjögren’s syndrome in 2011, and dealing with personal loss. Shontell: Well, you’ve changed the game a lot, and one thing that everybody brings up, and is powerful, is you stood up for equal compensation, really, for tennis players, female or male. Did you realise that you were going to start this movement when you were in your 20s? How did you bring about the change? Williams: Nope, no – zip, zero idea, zero plan to be a part of it, none of that. And in a lot of ways I was credited for equal prize money, but really it was a team of people who worked super hard, from the WTA, and we had amazing leadership that really, really fought for it. So it was definitely collective, and I just happened to be somehow in the front. I still don’t know how that happened. And here we are today. I’m so happy it happened. It was a collective effort. Shontell: One thing I wanted to ask you about, and I know it’s hard, but I think it’s important because tough moments shape our careers a lot. You had a sister who passed away when you were 23, and she was your personal assistant. How did you, cope and not just become so overwhelmed with grief, because tennis is a really mental sport, and it’s a tragedy. Williams: It’s amazing when tragedy strikes, how strong you find that you are, and I’d seen other people go through horrible things. And I just thought, “Wow, I would be a complete mess,” and then suddenly when it happens, you realise you had more strength than you knew and it helps you to get through. And thankfully we had family, we could help each other, and sometimes, you know, make each other laugh, and to this day we still help each other through it. Shontell: Do you have any advice for being resilient? Williams: Resilient? I think everyone deals with things in their own way. Everybody’s different. My family are all different. None of us are the same. We all deal with different things in different ways. I think it’s about knowing yourself, what pushes your buttons, and figuring out how to work with yourself. Shontell: Can we talk about your sister, because you’re super close? Shontell: She has called herself your “copycat.” She loves you fiercely and you love her fiercely. I have a sister and totally understand. And she’s said she wants to be just like you, have all the things that you have, and you’re both so accomplished. Has it ever been tough to share a dream with a sibling that you’re so close with? Williams: No, no, definitely not. I can’t imagine her not being there. I was always there for her, so I think for either of us, the experience wouldn’t be anywhere near the same. And I know that everyone else, when they’re on tour, does it by themselves, so I realise that it’s possible to do so, but in our case, it’s just not how it happened. Shontell: But it must be tough playing against each other. I remember seeing an interview with you when you were younger, and the interviewer asked you, “What’s the toughest match you ever had?” and you were, like, “My sister.” He asked you why, and you just said, “It’s horrible.” You’ve played each other a bunch of times, has it like gotten easier? Does the rivalry stay on the court? Williams: Obviously she’s a tough opponent, so when you walk out there, you’re thinking about how you can win the match and what openings you may have – and usually there are hardly any. That’s what I think about before I walk out on the court. How can I win this match? Where many others have failed, how will I succeed? And when you walk off the court, then you’ve walked off the court. At the end of the day, all I can control is my performance and, you know, be happy for my sister in the case that she wins, which is pretty often. 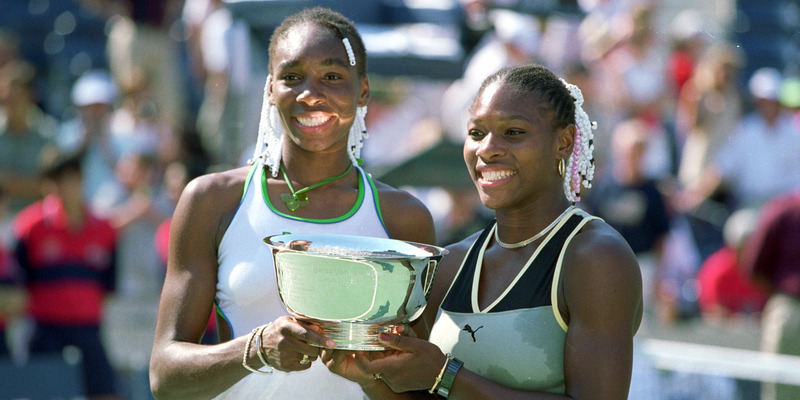 Shontell: You went on to win your first Grand Slam at age 20, which is incredible. First off, what’s it like to win something like that? Because most of us will never ever have even a slight taste of it. And then also, like, that’s your lifelong dream and you accomplish it at 20. Like, what do you do after? Williams: Win some more. Winning once is never anyone’s dream. We all want to keep winning no matter what it is, or if we retire, we all still are striving toward something, probably most of us are. Of course it was a great feeling and I was so determined. I don’t think anyone was more determined that year in the draw, and I wish I could feel that way every single time but, you know, there’s always a new formula to winning. Shontell: So 2011 was another bit of a tough year. You realised you had something called Sjögren’s syndrome, and for anyone who doesn’t know, it’s an autoimmune disease that can cause joint pain and chronic fatigue. How did you realise that you had this? And how did you cope with the diagnosis? Were you afraid that you might not be able to keep playing? Williams: No, I wasn’t afraid of not being able to play. I knew I had to come back. And I think in moments like that you don’t have time to be afraid. Things like that don’t even hit you right away. You go through at least a year or two of denial, like, “Are you sure? Take the test again. You guys are crazy.” That sort of thing. And it was definitely a long road, and there’s no one there to tell you how to do it so in my case, I’ve had to figure a lot of that out on my own, but there’s a lot of pride in that too. Shontell: It sounds like you had a pretty a swift recovery because you came back and won doubles. A Grand Slam within a year. Williams: Yeah, you’re right. It was. I had a great partner. That helps a lot. Shontell: You had to pull your weight. Williams: That helped. I tried to pull my weight. Shontell: How did you get your mindset right? How did you start recovering? You also turned vegan after that, right? Williams: Yeah, I tried to be vegan as well. I don’t always succeed. Williams: Exactly. There’s a cheese plate right next to us. In any case, I came back as soon as I could because the Olympics were coming, and that’s a huge motivation for me, to try to figure out how to get back on the court. And I just love the Olympics so that it meant everything to me to be there that year. Williams: Yeah, it was really not easy at all. Williams: It was closer to impossible, to be honest. But the best part was I knew how to play tennis and I knew how to win matches – that helped a lot. And then you fake the rest. I definitely wasn’t on the top of my game, but I managed to qualify. Theo Wargo/GettyWilliams founded and runs two business: EleVen, an athletic-apparel line, and V*Starr Interiors, an interior-design company. Shontell: So what are your days like now? How do you train? When you’re not in season, you still are training a tremendous amount. I know you said you skipped this morning, but most days, what do you do? Williams: Most days. Yeah, today I couldn’t, unfortunately, go on the court. In some ways, that’s nice, but in other ways you’re like, “I’m falling behind.” But more than anything, I’m just training as hard as possible on the court, hitting tons of forehands, tons of backhands, one forehand too many, maybe, and going to the gym and running and running, and there’s no better feeling than paying that price, and when you’re all done, you just feel the most ultimate satisfaction. A lot of people say, “Oh, I get this high from working out.” I’ve never felt that, maybe because I’ve worked out for so long it’s just a norm for me to push super, super hard. I don’t feel the euphoria. But at the end, when it’s all done, I feel euphoric. I’m like, “Yes, the work is done.” You just feel like a glowing feeling inside. Shontell: So you do hours a day, multiple times a week? Williams: Oh yeah. It’s my job. I have to get up and go to work too. Shontell: Like, six hours a day? Williams: On the court? God, no. When I was younger. But I spend like two – two to three hours on the court and then another two in the gym. Shontell: So you have a lot going on besides tennis. You’ve had a startup for 10 years, which I guess is not a startup anymore. But that’s impressive. Most businesses die in the first year, so congratulations. Shontell: You have EleVen, an athletic-apparel line, and you have V Starr Interiors, which is interior design. So it sounds like you’ve also always been interested in business. I read that your dad used to play business-related cassette tapes on the way to practice. Shontell: So it’s always been a passion of yours? Williams: Most definitely always been a passion, and always been one of my goals in life as a young person, to have my own business. My dad gave us his entrepreneurial mindset, so that was also ingrained, as well as the tennis. So in a lot of ways it’s a part of making my parents proud. I think we all want to make our parents proud, you know? Shontell: Absolutely. What have you learned in starting these businesses? It can’t have been easy. Williams: I’ve learned about employee relations; I’ve learned about following your instinct. One of the biggest mistakes you can follow is not following your instincts, you know? A lot of times your instincts will tell you what to do if you have a good one. Now, if your instincts are terrible, then you ask for advice. But if you have good instincts, you definitely have to follow them, or else you regret them. Shontell: And on your fashion line, you’re doing the sketches yourself sometimes, right? Williams: Yeah, the majority. Yes. Shontell: So you’re artistic as well. Williams: I try, I try. Shontell: So how are you juggling everything? That’s a lot, you know, getting ready to launch the spring line and running multiple businesses and then also training. And you were just in the US Open not too long ago. Williams: Yeah, I think it’s the same as tennis. You have to have the love, that helps, or else it’s just too much pressure to be able to keep up with. And also you have to have the team. At EleVen, we do everything. From the initial design to manufacturing the product to distribution, we do everything here in the United States, our distribution centres. Our warehouses are in the front, distribution in the back. We make many things in California, ship them to Florida, ship them out to our customers, we run our own online business. Every department is in-house, so that’s great. And we made that move a few years ago, and we haven’t looked back. So every time we’re, like, “This isn’t working; let’s take control of it ourselves.” So it’s awesome to be in control of all of that, and at V Starr we have about 10 employees, and we do commercial design. We work not so much in residential – we have maybe one residential client. Everything else is hotels or condominiums, or we work on sports centres. Shontell: How do you manage the stress in your life? Because this is all very busy and it’s, I’m sure, stressful. Williams: Well, I think there’s more stressful periods than others when you’re launching new things or going into a new business, or there are many things that can stress you out. Having to let people go, that’s stressful. Never fun. But for the most part, I try to manage a schedule that’s achievable and try not to make a schedule that’s not. And a lot of times, sometimes it becomes a little unmanageable, but in spurts. So I think being able to make an achievable schedule, one that I know I can accomplish. Shontell: You’ve changed the sport of tennis in everything that you’ve done. What advice do you have for someone who has a childhood dream and wants to follow it and wants to be just wildly successful like you? Williams: Thank you. Just always believe in yourself. “Champions adjust.” It’s a line I learned from Billie Jean King, and sometimes your dream adjusts. Be willing to adjust with it and see where your opportunities … sometimes a door closes but a window opens, so just follow your dreams and continue. You never know where it’s going to take you. Shontell: I thought you had some good advice, too, that even if you feel like you don’t deserve what you’ve gotten, ask yourself why. Can you elaborate a bit on that and how you’ve gotten to a good place? Williams: Yeah. I mean, most of us have grown up, you know, I think there are very few people who have grown up in a home that was, like, super normal. You know, we all have dispositions because maybe you didn’t have a mum or you didn’t have a dad, maybe your mum died early or maybe mum and dad argued or they got a divorce or who knows? You have issues that maybe you’ve started younger or maybe you have your own issues because you have them. Whatever it is, people have issues and that affects you deeply. So you have to get to the bottom of it and not let that affect your life decisions and really understand why you’re making the decisions you make so that way you can understand how to not do that, so I always encourage people to ask why and then to really understand you, because that’s the only way to be your most successful and your most happy. Shontell: Great, well thank you so much for the time, Venus.